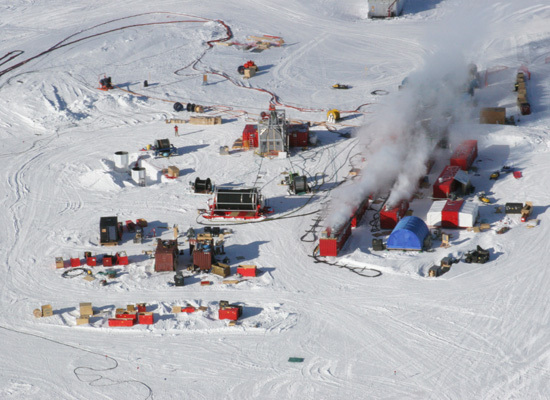 A team of astrophysicists and engineers are busily boring through the ice caps of Antarctica. More than 70 holes will be drilled, spread out over an area approximately 1.5 square miles. 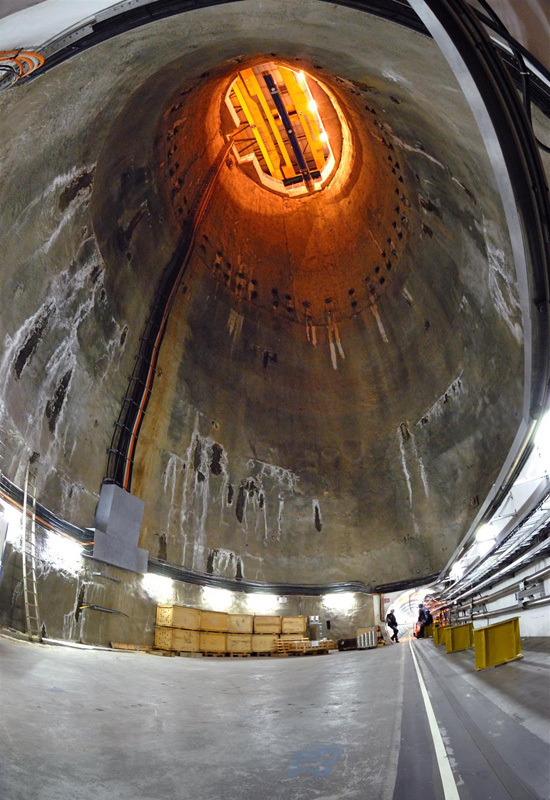 Each one will be 1.5 miles deep, or at least 4 times the height of Sears Tower, and wide enough to fit one person snugly. 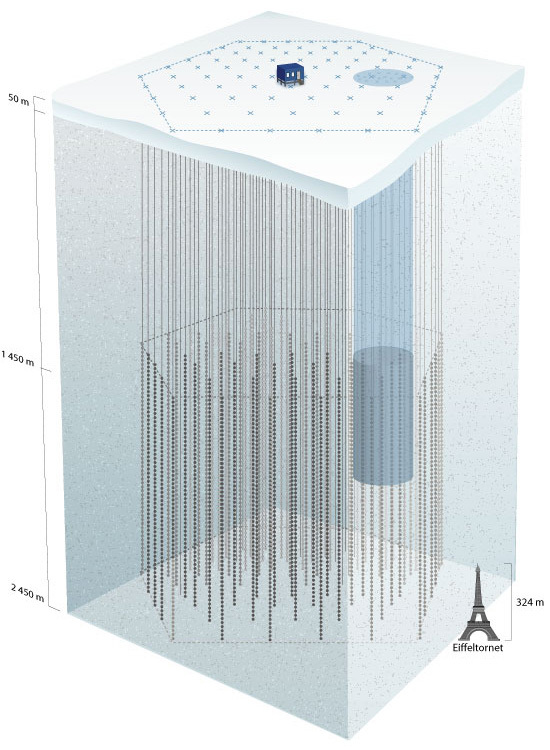 A string with about 60 optical sensors will be lowered into each hole, after which water is pumped in and allowed to freeze, thereby locking the sensors in place. It's a telescope, of course. 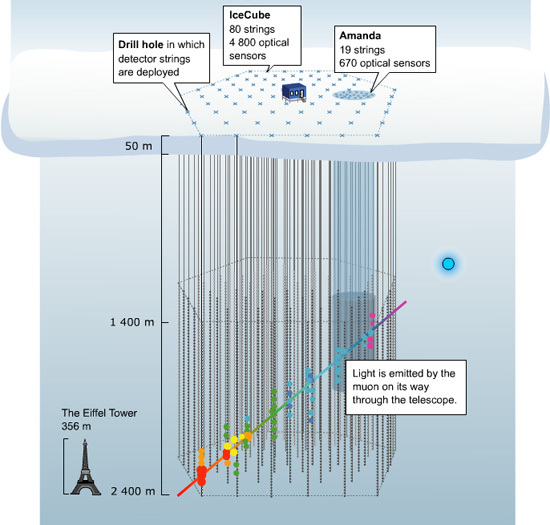 Called the IceCube, it's a chunk of the polar ice caps turned into a gigantic scientific instrument, which astronomers hope will capture a few wayward neutrinos, those extremely elusive subatomic particles that travel for millions of light years through space, passing right through galaxies, planets and extraterrestrial civilizations but rarely colliding with even a single atom. In fact, trillions of them are passing through your body while you're reading this post. Right now. Every second. Undetectable. These ghost particles come from exploding stars, gamma ray bursts, black holes and neutron stars. 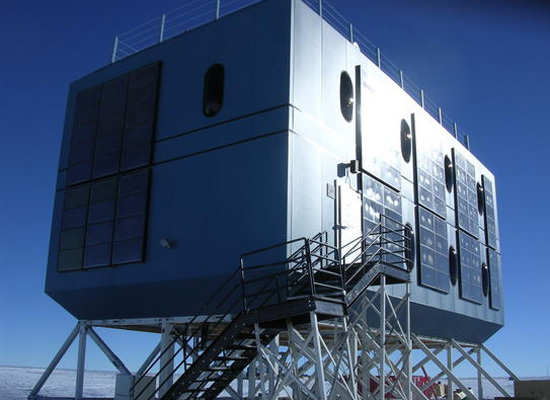 So when completed, this cubic kilometer telescope will enable scientists to gaze into some of the most distant bodies in the cosmos and witness its most violent events. And if those aren't enough, it may even help to unravel some of the mysteries behind dark matter. Trying to observe neutrinos — and other cosmological phenomena — always seem to make for fascinating landscape and architecture. 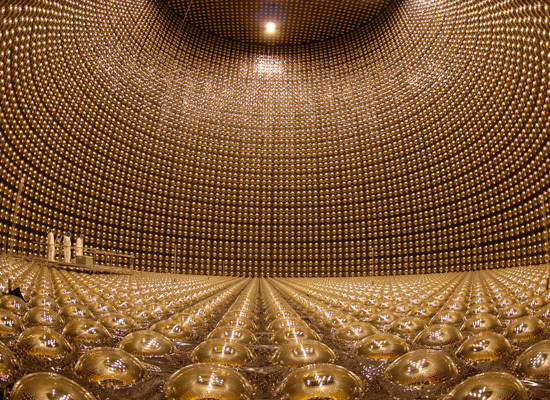 For instance, there is the Super-Kamiokande, that water-filled “giant crystal cathedral” somewhere deep underground in Japan. It once suffered a catastrophic accident six years ago but was recently restored to its former beatific grandeur, as the photo below can attest. And then there's CERN's Large Hadron Collider, featured twice before on Pruned here and here, which when it comes into service later this year or the next, will help scientists detect subatomic particles far more elusive than neutrinos. The Very Large Array radio astronomy observatory in New Mexico is a favorite landmark on Google Maps. 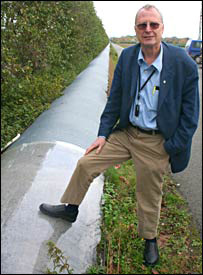 “The sheeting hides a trench,” the article goes on to explain, and protected within is “the vacuumed tube of an experiment Hough believes will finally detect the most elusive of astrophysical phenomena - gravitational waves.” Angled perpendicularly to another tube, both of which have been plopped down on the countryside, both running next to some country road (which must surely offer travelers picturesque views of quaint English cottages and pastoral landscapes), besides hedges, through farms and pastures, surriptitious and rather banal looking — it's a new kind of telescope for a new kind of astronomy. Which leads us to wonder what other astronomical infrastructure lies half-hidden somewhere in the landscapes, masked as public works in the streets of, say, Chicago or as ornamental decorations on the sides of gentrified high rise condos and intentionally innocuous office towers or as patches of urban forests whose trees spend all their time detecting and capturing intergalactic radio waves instead of sunlight for photosynthesis — all of which have been aggregated and networked into a kind of telescope the size of North America. The vernacular built environment as a subfield of astronomy. Or vice versa. Landscape architects and neighborhood gardeners would be recruited. You sign up on some website, and before the week is over you receive a small package containing seeds in the mail. But they are not just any seeds. These ordinary-looking seeds have actually been genetically modified to detect X-ray bursts from the sun or from some extragalactic sources located halfway across the Universe and emitted billions of years ago. Come winter, you send in dead flowers, leaves and whatever seeds that have been produced to a central processing lab where they are grounded, bombarded with lasers, and analyzed. Gardening as collaborative distributive astronomy. Or instead of plant material, you get some weirdly futuristic devices and contraptions that look like — and do indeed function as — lawn edgers or cupolas for your gazebo, but obviously you know full well that they attuned to the songs of black holes. Large professional firms, meanwhile, will get something a bit larger — a freight shipment of what must seem like a full-scale version of Frank Gehry's stainless steel acoustical tresllis, which must be installed in their next Super Park project. There, above the heads of picnickers enjoying the night's program of light classical music, it will scan the heavens for remnants of the Big Bang. The whole earth upturned so that we might get a glimpse of Creation.